AUSTIN – Texas Parks and Wildlife Department (TPWD) Inland Fisheries staff conduct dozens of habitat restoration projects each year to enhance fish habitat in Texas’ aging reservoirs. But fisheries biologists can’t do these large-scale projects alone, they rely on Friends of Reservoirs partners to help make Texas fishing the best it can be. 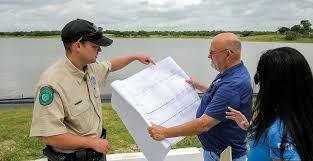 Although many Texas reservoirs benefit from established Friends of Reservoirs chapters, TPWD is looking to expand the number of partners around the state who are interested in participating in habitat projects at their local reservoirs. “We are targeting conservation-minded groups like fishing clubs, master naturalist groups, lakeside homeowner’s associations, high school fishing teams, conservation organizations and virtually any public group that is interested in working with us to improve fishing or habitat for fish in public lakes,” said Dave Terre, TPWD Chief of Inland Fisheries Management and Research. Habitat restoration projects conducted by TPWD fisheries biologists and local Friends of Reservoirs chapters range from placing GPS-marked natural and artificial fish attractors in reservoirs to increase angler catch rates to planting native vegetation along the shoreline to provide fish and wildlife habitat, improve water quality, and prevent shoreline erosion. Friends of Reservoirs chapters are essential to making these projects happen by fundraising and recruiting volunteers to help assemble, haul and drop fish attractors in the lake and plant native vegetation along the shoreline. Organizations interested in becoming partners on habitat restoration projects in their local lakes can send a representative for free to the Friends of Reservoirs 9th Annual Reservoir Fisheries Habitat Partnership Meeting the weekend of Oct. 6-7 at the Texas Freshwater Fisheries Center in Athens. The event will feature presentations on ongoing state and regional habitat projects along with information on permitting, structure, nuisance aquatic vegetation, establishing native vegetation and grant funding. Pre-registration is required to attend the workshop. For more information or to pre-register contact Dave Terre at dave.terre@tpwd.texas.gov or (512) 389-4855. There are currently 24 Friends of Reservoirs chapters partnered with TPWD to enhance their local lakes, a list that includes recent award winners like the Lake Fork Sportsman’s Association, which was inducted into the Texas Freshwater Fishing Hall of Fame in 2018, and Lake Livingston Friends of Reservoirs, which was designated as a Conservation Wrangler by Texan By Nature in 2017. To learn more about these organizations, visit www.friendsofreservoirs.com.